Eiko Ishizuka has performed in Japan, Israel and the United States with a broad repertoire of classical and musical theatre music. She earned her Bachelor of Music from Kunitachi College of Music, Japan, and the Certificate and License in Dalcroze Eurhythmics at the Longy School of Music. She has studied piano with Yukiko Takeyama and Yuko Kido. She is a member of the Dalcroze Eurhythmics faculty at the Longy School of Music Conservatory Division in addition to WCMS. She was an accompanist for Shinonome Choir and Congregation of Jesus. Ms. Ishizuka is a member of "Music Alive," an outreach musical group with which she performs in the Boston area as pianist and actress. She has been collaborating with dancer Alissa Cardone, and performing improvisational work together. 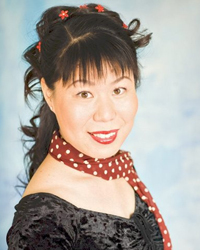 She founded the improvisation performance project "Impromptu."